‘Jersey Summer Music’, is the new programme of summer music courses run by the Jersey Academy of Music and Jersey Music Service and open to all young musicians on the island. 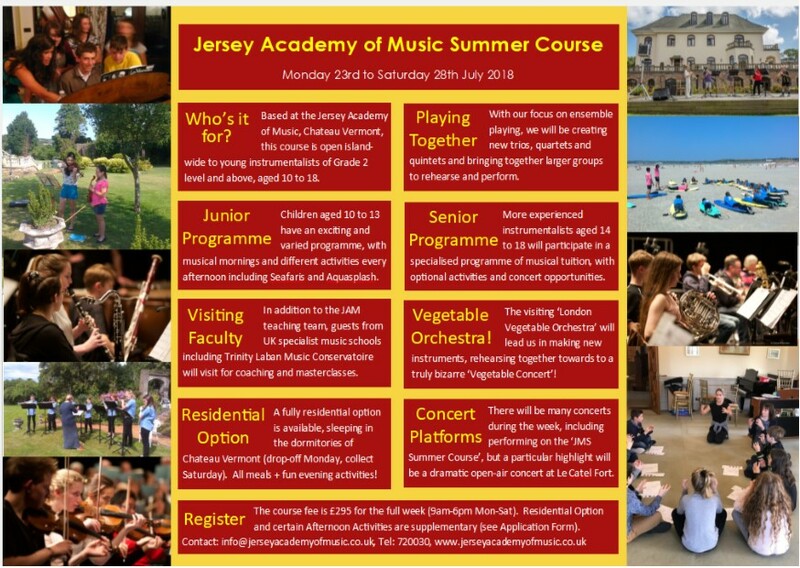 The Jersey Academy of Music Summer Course is aimed at young musicians aged 10-18 and Grade 2 level and above, with separate Junior and Senior programmes for the different age groups. A range of activities, and a fully residential option are also available, with a Visiting Faculty of music college teachers coming over to join the JAM teaching team. Not to mention the visiting London Vegetable Orchestra….! 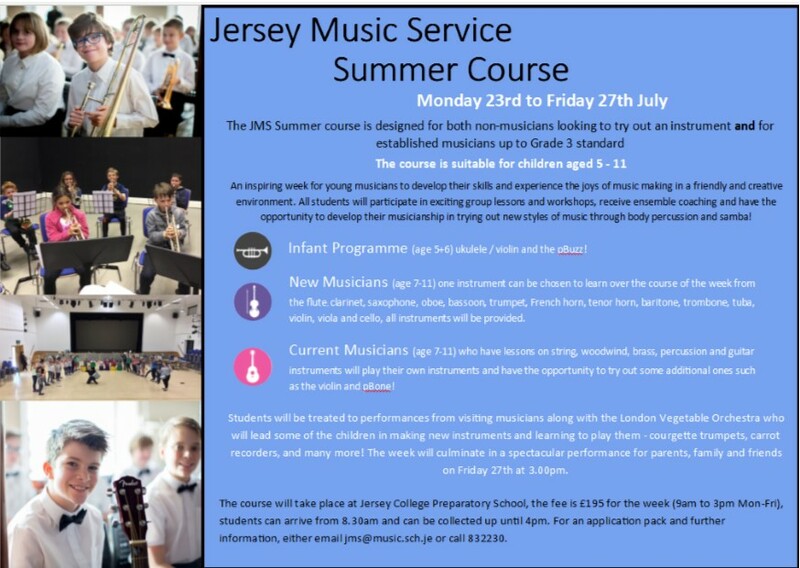 The Jersey Music Service Summer Course is for children aged 5 to 11, and is designed for both non-musicians looking to try out an instrument and for established musicians up to Grade 3 standard (contact JMS for an application form and any further info). You can pick up a brochure from JAM, any school on the island, Island Music, or public centres such as the Library. The brochure also contains information on Jersey International Masterclasses, the music course for older music college students run by the Jersey Academy of Music in partnership with the Royal College of Music. Keep an eye on their website (www.jerseymasterclasses.com) for information on some impressive concerts which are open to all to attend. Piano: Hayley Parkes, a multi award-winning pianist, recently chosen as an ambassador for Britain at the ‘Commonwealth Resounds’ conference in Perth, Australia. Woodwind: Simon Williams, a flute and saxophone specialist who recently performed on the UK tour of Funny Girl, and other shows include Grand Hotel, 9 to 5, Into the Woods, Sweeney Todd, and West Side Story. Brass: Steve Thompson, a renowned trombonist and teacher, one of only a handful of musicians to play live in both the opening and closing ceremonies of the London Olympic Games in 2012. Strings: Damon Flanagan, professor of violin at the Junior Department of Trinity Laban Music Conservatoire, London. We also can’t wait to meet the members of the London Vegetable Orchestra for this potentially hilarious workshop and concert. They were on ‘Room 101’ with Frank Skinner on BBC1 recently, click here! And finally….for the Fully Residential option, we are delighted to confirm that La Maison Gourmande will be providing hearty home-cooked evening meals each day, yum! We hope to welcome lots of children and young musicians for a week of guaranteed fun and inspiration!